LED T8 EZ4 replacement light bulbs in 4000K light color can operate on T8 instant start electronic ballasts OR T12 magnetic 2 lamp ballasts OR 120/277 volt AND AC single or double end power. Now you have a choice as you retrofit existing light fixtures without worrying about which lamp to use, this one truly has it all covered. It's the ultimate flexible LED tube light bulb for any lighting situation. This is the easiest, most cost-effective way to upgrade fluorescent linear lighting to more efficient LED 4 foot tubes. For those of you who are unsure whether the LED light bulbs you need will work in every situation that you have, this might be the solution for you. This particular light bulb works on nearly everything that you may have whether it's an instance start ballast or direct wiring. It's a perfect way to have the best of all possible worlds when it comes to an energy saving replacement. Its high-quality and sophisticated electronics make it possible to do this and come with a five-year warranty. If you're unsure whether it will work for you, you can always give us a call and we can help you determine that. There are situations where some people want to start off with a basic retrofit, without any rewiring with the potential to change that down the road. With this type of LED light bulb, you don't ever have to buy another light bulb to do another retrofit task. For some people, they will simply replace the bulb to operate on an instant start ballast and as though starting to fail, don't do the rewire to directly 120 or 277 volts. It's one way to make a flexible investment to make sure your future proof of any changes that might come no matter what kind of lighting system you may have right now. These are DLC listed so they qualify for most utility rebate programs that you may have in your area. - Replaces F40T12 or F32T8 lamps. 1 Existing electronic and some magnetic ballasts. Energy efficiency has never been easier. At BuyLightFixtures.com, we not only want you to get the best energy savings possible from any new type of LED T8 bulbs but also get the best possible lighting that you can get for your situation. We always say that if you get fantastic energy savings, but your lighting has degraded or doesn’t do the job it was meant to do, then you haven’t gained anything. It’s not just about energy efficiency, but it’s about getting both those in balance, so you get the excellent lighting you need in this opportunity to upgrade. Most of the time these are at tube replacement for F32T8 fluorescent bulbs, but other links are available such as the two foot and three-foot versions which replace F17T8 and F25T8 medium bi-pin lamps. There’s never been a better time to take a look at saving energy because the paybacks are so right on these. You can be assured that you’re going to get a payback somewhere in the 1 to a 3-year range or less depending on how you use them or possible utility rebates that are available in your area. And keep in mind that those utility rebates can be reasonably lucrative with if you have a commercial building or a retail store or have warehouse or manufacturing facilities. The light output and the color temperatures are the same as the older fluorescents that you would be replacing. The active light output with LED is the same, and you’re going to get the same footcandles down on the surface. You will also maintain the same look of your light fixtures with a linear source that people often have a hard time telling the difference between that and a fluorescent. So if you are thinking about doing some retrofit, make sure you download our spreadsheet which is an energy-saving calculation sheet. 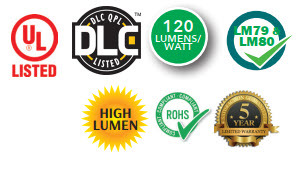 It’s on the left-hand column of our website and will give you a very close estimate as to how much you will save based on the data from your existing system to what you may be going to with LED. Using LED tubes people get fast paybacks and an excellent return on investment. And although this is not an exhaustive audit spreadsheet, it will give you a rapid estimate as to how much you’ll save not only in energy but also in maintenance cost and give you all that data so you can make an informed decision if you merely want to replace fluorescent with a compatible LED. The common types of replacements. Most of the time people have wired directly into power coming from the light fixture into the socket and decided to bypass the ballast. This is the most common type of retrofit these days because people want to eliminate a ballast if they can. Although we do have LED T8 tubes that operate on an electronic ballast, many people opt for rewiring so that nobody can go back again to a fluorescent. And in the case of some utility rebates, that’s something they demand in order to give you the incentive to go to something that’s more energy-efficient. 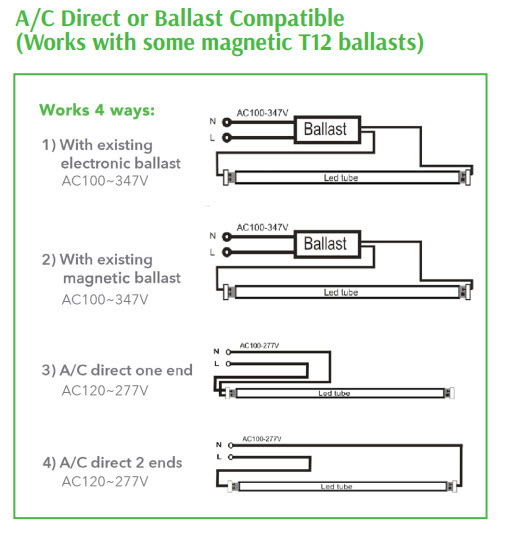 For those of you who want to do something a little bit different when it comes to retrofitting, we do have specific tubes that can either operate on ballast or operate on direct power. Some people like to do this because they can save the labor cost of putting in the new tubes. What they can do is just put these in the light fixture and leave the ballast in and then when the ballast goes out, they can wire it to power by passing the ballast. And those are very reasonable cost and give people ultimate flexibility if you don’t have the dollars for the labor cost of changing something out. In this way you can just have your maintenance person replace the lamps and then do the rewire later as things go out. It’s a new twist and a lot of people think it’s a good idea to have something that’s so flexible for the future. The question we often get asked is it better to go with LED tubes in a new light fixture or use an LED array with no bulbs. If you use the bulb type of retrofit or new light fixture, you can always change the lamps later if you want to have a different color or maybe a higher light output, you will have that choice. With the no lamp option, just an LED array, you won’t have that choice in the future. But often you will have a dimming capability with that. So that’s the trade-off and that’s something to consider. With the LED bulbs being the way they are these days, with the excellent light output in total flexibility, we often think it’s better just to buy these replacement tubes and change things out that way. The cost is usually less and it makes sense for future proofing your lighting system. One of the other significant considerations is color temperature when you’re looking at this type of change to LED T8 bulbs. Color temperature is critical because it reflects on what it’s going to do to your interior space. It’s been often said that color in a room or an area is how you light it. No matter what kinds of paints and different types of interiors you have, the light color makes all the difference as to how it’s going to look eventually. Sometimes you can paint something one color and that it seems completely different because the lighting is different. So some of the color temperatures that are available span everything from 2700K warm white, 3000K soft white, 4100K cool white and the popular 5000K daylight white color. For those of you who want to create a warmer atmosphere, the lower color temperatures work much better. These are often good to use with earth tones and different types of colors used in an interior space. This would be for something like your home or a specific area that you want to keep that warm feeling like an incandescent color. The 4100K is like office lighting white, and that gives a clean, efficient appearance that many people prefer because it’s very good with contrast and people can see reasonably well under that. The daylight 5000K is like outdoor sunshine, and many people prefer this for many types of applications. They like it because it has a white appearance, good with contrast and readability and for things like factories it can help make people more productive. It produces light the way our eyes were most naturally made to use it. Artificial light is a relatively new wrinkle in human history, and before that, we were either under daylight or would illuminate by fire. Outside daylight is what we best respond to, and our eyes can see the best in. So this is an excellent choice for many different types of interior applications but also outdoors. 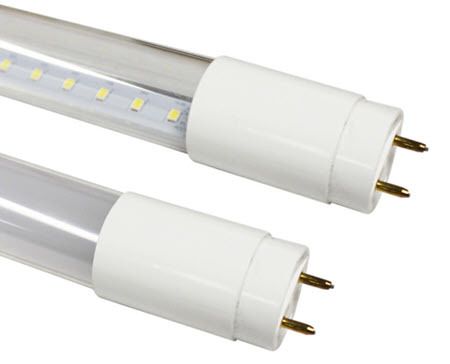 For these LED tubes, it seems that most people are going with the 5000K because it looks so white and clean. If you’re unsure of which type of LED tube that you need to use in your particular situation you can always call us or email us with a question and will be happy to help you. We have a lot of experience with this product and many successful projects. People of seen the difference in how well their lighting looks and the money they save. And although saving money is important, keeping a mind that good lighting will also help either sell a product or make people more productive even though that can be hard to quantify. It’s one of those soft effects that can’t be justified by the bottom line as your electric bill can. But if you save money on your expenses and at the same time get an improvement in lighting, you can be guaranteed you’re covering both bases very well. There’s never been a better time to take a look at this type of improvement in lighting because now you can get it all, energy savings and better lighting without making any sacrifice. Call us if you are a more significant quantity user such as an electrician, building owner, property management company, and we can help you with pricing that is special for multiple case quantities. We want you to be successful in changing to more efficient lighting with these LED T8’s no matter which one you decide to choose.